The Spore Creature Creator has exceeded Will Wright's highest hopes, with the number of creatures created with the software now exceeding the number of known species on Earth. Released in mid-June, the Spore Creature Creator is available in both full retail versions and a free demo release, which offers limited functionality. The software was an immediate hit with gamers, resulting in the creation of 250,000 Spore creatures in the first day of release. "I was really hoping we'd get 100,000 creatures by September and a million by the end of the year," Wright said during a Spore demonstration at E3. "We hit 100k in 22 hours and a million by the end of the first week. The numbers are just blowing us away." According to an AFP report, the number of creatures in the Spore database surpassed the number of known species on Earth in the second week of July, a remarkable effort but not quite enough to beat the Biblical high score. "It took them 18 days to reach the number of creatures on Earth and, by some accounts, it took God six days," Wright said. 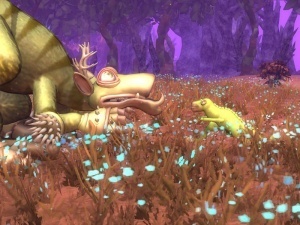 The creatures created by gamers will populate the Spore game world via a central server, which will catalog and rate player-created content and then disperse the material to other player's games. Along with various species, gamers will also be able to visit planets created by other players and interact with their civilizations. Spore, the hotly-anticipated new effort from Will Wright and Maxis, is scheduled for release in September for the PC and Mac.